You may feel frustrated when trying to copy specific media, such as Apple Music songs or Audible books to your MP3 player as you would probably end up with the “file not supported” error. Have you figured out the cause and get it resolved? If not, you can follow this guide as we are going to introduce an all-round solution for you so that you can easily play any of your audios, no matter it’s from Apple Music, iTunes, Audible or other sources on all popular media devices seamlessly. DRM, short for Digital Rights Management, is a type of copyright protection method applied by many digital media providers to control the use and distribution of those contents on selected devices and platforms only. Take Apple Music as an example. Since Apple encoded the songs in its Apple Music Store with DRM, subscribers only have the right to play the Apple Music tracks on authorized devices with the specific Apple ID. In result, it’s impossible to share and play the protected songs on non-Apple authorized players. The same case goes for Audible and iTunes audiobooks. In order to get rid of the DRM copyright restriction from those audio tracks, a smart tool like TunesKit DRM Audio Converter for Mac would be highly recommended as it’s able to help you completely remove DRM from Apple Music, iTunes songs, audiobooks, Audible AA, AAX and convert the protected files to DRM-free formats so that you can play them on any device as you want. 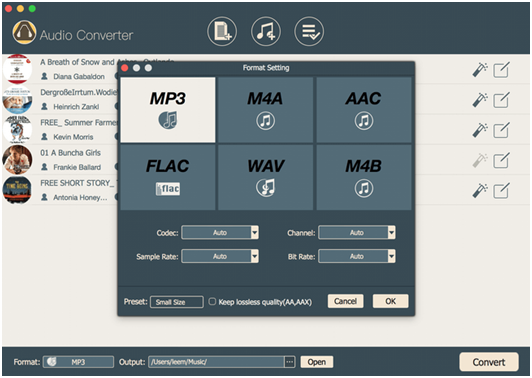 The best part of TunesKit DRM Audio Converter is that it not only converts the DRM-ed audio files to MP3, AAC, WAV, FLAC, etc, but also converts between unprotected audios, making it the one-stop audio solution for any audio conversion need. Besides, thanks to the easy-to-use interface, even beginners can handle it well without referring to the user guide. Launch TunesKit DRM Audio Converter, click the second “Add” button at the top center if you want to convert the DRM-protected audios, like Apple Music, iTunes songs, Audible audiobooks. For DRM-free audio files, simply click the first adding button. Once loading those audios, click on the “editing” icon at the end of each audio track. Then you’ll be prompted to select the output audio formats in a new window. 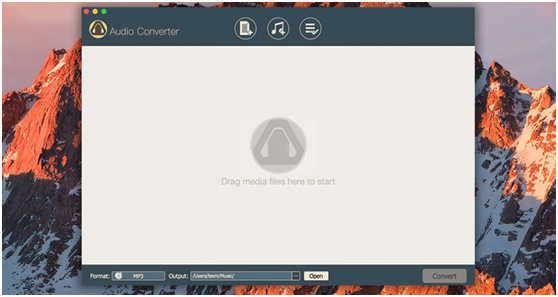 After setting the output format and destination folder, you should click the “Convert” button and it will start to convert your audios at up to 30X faster speed. What makes TunesKit DRM Audio Converter for Mac stand out among all similar software is its strong ability to convert both DRM-locked and DRM-free audio files. In addition to that, you’ll also be impressed by the great quality and performance it delivers. If you are looking for a reliable DRM removal solution for all main stream audios, TunesKit DRM Audio Converter would definitely be your first option. It’s available in both Mac and Windows platforms. The full version is priced at $39.95 with lifetime free upgrade and tech support. You’d better download the free trial to test it out before making any payment to it.